Michael Frayn’s farce Noises Off (1982) has often been called one of the funniest plays ever written. Technically, it is also one of the most difficult. Any company, like Soulpepper, that gets through the play’s enormous physical demands so effortlessly deserves praise simply for its precision and stamina. Yet, the current production of the play, amazingly the first ever by a professional company in Toronto, is uneven. While Act 2 is very close to perfection, the pacing in Act 1 is oddly slow and Act 3 ends in a manner quite unlike the previous two productions I’ve seen, including the play’s American premiere. What make Noises Off a farce to end all farces is that it is a farce about staging a farce. British television star Dotty Otley (Brenda Robins) has chosen a farce called Nothing On as a vehicle for herself to tour the provinces in hopes of gaining a little income to live on. She has cast the show mostly with other television actors who have little experience on the stage. Frayn’s play is unusual in that we see Act 1 of Nothing On three times. In Act1 of Noises Off we see a disastrous dress rehearsal for Nothing On where the actors still don’t know their lines or have their on stage business worked out much to the exasperation of the director Lloyd Dallas (David Storch). In Frayn’s brilliant Act 2, we see the first act again one month later, only this time we see it from backstage. By now the actors have begun to hate each other and, due to various love triangles that have formed, have started sabotaging each other’s performances. In the final act set about eight weeks later we see Act 1 of Nothing On at the end of its calamitous tour where the actors have now come to expect that everything will go wrong but struggle onwards anyway. People may wonder how Michael Frayn, a philosopher as well as a novelist and playwright could write such different plays as a farce like Noises Off and a highly intellectual play like Copenhagen (1998) about nuclear physics. The prime similarity in both is in viewing the same event from different points of view. 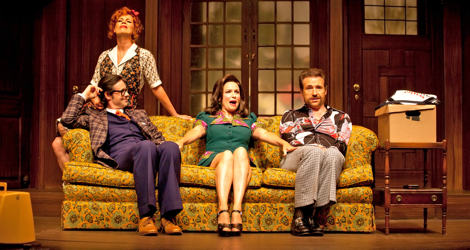 In Noises Off it is the first act of a farce seen under three different conditions. In Copenhagen it is the meeting between Niels Bohr and Werner Heisenberg related from three different points of view. 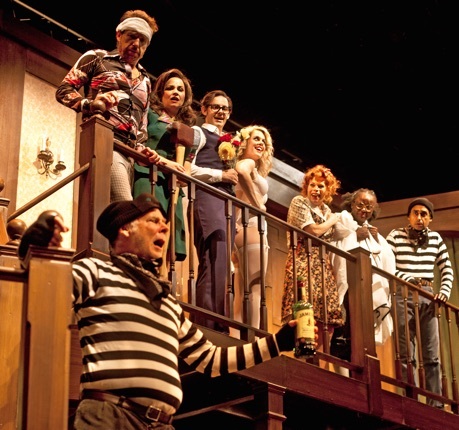 An ideal production of Noises Off should give us an insight beyond what we find in average farces. In Noises Off Frayn gives us a vivid depiction of entropy, a universal law in physics, observing that all order gradually declines into disorder. Like Samuel Beckett’s characters in Endgame (1957) or Happy Days (1961), Frayn shows us especially in Act 3 how characters struggle valiantly to fend off the chaos into which their show has declined. In Soulpepper’s production a number of odd directorial decisions prevent Noises Off from being as effective as it should. First is the unevenness of the pacing. Farce is the most theatrical of all forms of comedy and depends little on characterization and almost entirely on timing and precision of movement. While Lloyd Dallas’s dress rehearsal of Nothing On is all starts and stops, Ted Dykstra, director of Noises Off has to find a way to keep the play’s momentum going despite the halts in rehearsal. This he does not do and Act 1 of Noises Off feels as draggy to us as Act 1 of Nothing On does to Lloyd Dallas. Act 2 of Noises Off, is perhaps one of the most technically complex acts ever written for a comedy. The actions we see backstage have to be perfectly timed with the entrances, exits and lines of Nothing On that we have already heard in the previous act. The precision and timing needed for this act plus the sheer physical stamina necessary are astounding. Besides that, the highly choreographed actions have to appear natural or they will seems merely mechanical. Dykstra and his cast bring all this off with flying colours making Act 2 the highpoint of the evening. on a revolve. The Baillie Theatre, however, does not have a revolve. Most of Patrick Clark’s set sits on a large truck (as it is called) and has to be physically rotated by the stagehands 180º for Act 3. This, plus attaching the fussy parts of the set not on the truck takes the crew the entire 15 minute intermission. The unavoidable problem is that all the energy built up during Act 2 thus dissipates before we arrive at Act 3 and the contrast between the two acts is not as great as it should be and as Frayn envisioned. Dykstra can do nothing about this situation. He could, however, have managed to keep the play’s ending intact. Dykstra omits a portion of the text just before the final curtain when Lloyd is “married” to both Vicki and Poppy thus providing comedy’s conventional “happy ending”. It also finishes off in witty style the love triangle with Lloyd, Vicki and Poppy that has continued with ups and downs through the previous two acts. Besides that, Dykstra gets the tone of the conclusion quite wrong. Lloyd the director is onstage but struck with stage fright leaving the actor Belinda Blair (Raquel Duffy) to interpret what she thinks his silence indicates. When the cast wnats to know what to do, Belinda comes up with such oracular phrases as “doors and sardines”, “phones and police”, “bags and boxes” before hitting on the idea of “sheets” which leads to the Lloyd’s “marriage” to Vicki and Poppy. While previous productions have portrayed this conclusion as an increasing series of desperate acts as the play descends into complete disorder, Dykstra decides to turn it into a full-out celebration where the bags and boxes are tossed gleefully from one to the others. This clashes not only with the view of the play as a depiction of entropy but also contradicts such words in Frayn’s stage directions as “helplessly”, “beseechingly” and “floundering” all of which suggest desperation not celebration. Although a play like this Noises Off most definitely requires an ensemble cast, certain performances stand out as particular noteworthy. Unlike the rest of the actors playing actors, these three are the only ones to distinguish their onstage persona from their off-stage persona. The finest portrait comes from Brenda Robins as Dotty Otley who adopts an exaggerated Cockney accent when playing the Maid in Nothing On. When we first see her in character Robins lets us know through her expression of unusual concentration that Dottie fears she has got herself into a situation, i.e. acting on stage, that she can’t handle. Yet, Dottie tries to brush off this fear with gentle self-deprecation. What really sets Robins apart, however, is her portrayal of Dottie in Act 3. Robins shows us a woman who is now a shattered being, inured to the fact that she can’t remember her lines or what actions to perform. Robins hilariously has Dottie drift through the act as if in a state of shock, beyond any notion of coping with the situation. Matthew Edison, who has always had a flair for verbal comedy, reveals here an equal flair for physical comedy. He presents Garry Lejeune as a deadly combination of self-importance and dim-wittedness. Frayn frequently gives Garry lines complaining of Lloyd’s direction but they are so comically vague and inarticulate often concluding with “you know” that they are completely ineffective. Edison is a master at delivering these lines so that we feel we know what Garry is trying to say even if he doesn’t. Edison’s timing in physical comedy is superb and he pulls off several about-faces and other stunts. How he can manage to tumble down an entire staircase, glasses flying off his head at just the right moment, without hurting himself is a marvel. Unsurprisingly, Oliver Dennis is delightful as Selsdon Mowbray, an aged stage actor who is now an alcoholic. Dennis has Selsdon belong to the old Gielgud school of declamation which makes a huge comic contrast with his present role as an aged burglar. Dennis’s physical comedy involving Selsdon’s attempt to keep possession of a bottle of whisky is a treat in itself. The main flaw in Dykstra’s direction of the cast is how he approaches the actor Frederick Fellowes. Freddie seems to be a hypochondriac and gets nose-bleeds when he sees violence. Alone among the cast, he keeping asking Lloyd for motivation for his character. Who knows what Dykstra is aiming for but the way Christopher Morris plays Freddie makes the character come off, unlike in previous productions, as an effeminate gay man. This is quite unhelpful. When we learn that Freddie’s wife has left him, we assume that it is because she finally realized he is gay. Because of this Dykstra fails to establish that Dottie deliberately flirts with Freddie in Act 1 to make Garry jealous. Why would her flirting with a gay man affect Garry? This error is important because it sets up all the fighting between Garry and Freddie in Act 2 along with Garry and Dottie’s mutual animosity. When we come to it in Act 2, we don’t really know why it’s happening. Other than this, all the players do well. David Storch is excellent at showing how director Lloyd Dallas is barely able to conceal his frustration even when he is called on to smooth the actors’ feelings. Raquel Duffy makes Belinda Blair the real backbone of the company. Belinda may be the company gossip but she also is the only one to keep her head when all around her are losing theirs and Duffy makes both sides of Belinda clear. Newcomer Myrthin Stagg is well cast as Brooke Ashton, a kind of living Barbie doll. Brooke may be the dumbest of dumb blondes ever created for the stage. Yes, she knows all her lines and the blocking, but unlike Garry or Belinda she doesn’t know how to improvise and when all goes wrong keeps doing the part she has learned as if she were an automaton. Stagg does so well we wonder whether Brooke even has anything that could be called a personality. Oyin Oladejo and Anand Rajaram play the only backstage members of the show – assistant stage manager Poppy Norton-Taylor and stage manager Tim Allgood. Both do well – Oladejo’s Poppy shy and unassertive and Rajaram’s Allgood constantly flustered. Anyone who has never seen Noises Off before may be quite satisfied at having seen a bit of wacky fun on stage. But the play is not by Ray Cooney or Ben Travers, but the highly intellectual Michael Frayn. Anyone lucky enough to have seen the original production will know that there is a depth to the play as an image of all human endeavours that Ted Dykstra misses both by allowing a lack of clarity in the plot and by deliberately trying to force the ending into a celebration of theatre when it is really a thinly disguised Totentanz. The collapse of the farce-within-a-farce into chaos, not exultation, should make us laugh, as in absurdist comedy, at the vanity of human achievement even while the play Noises Off impresses us with the wonders that people can achieve. The contrast between the two is what makes the show almost painfully funny. Dykstra and the cast get there in the delirious Act 2. If the other two acts had reached those heights, this Noises Off might have been one of the must-sees of the year. Photo: (from top) Brenda Robins, Matthew Edison, Raquel Duffy and Christopher Morris; Matthew Edison and Myrthyn Stagg; Oliver Dennis, Christopher Morris, Raquel Duffy, Matthew Edison, Myrthin Stagg, Brenda Robins, Oyin Oladejo and Anand Rajaram. ©2016 Bronwen Sharp.